SACRAMENTO, Calif. (AP) Damian Lillard didn’t fight Portland coach Terry Stotts’ decision to sit him in the fourth quarter, even though the Trail Blazers point guard was well within reach of his career high for points. Having scored a season-high 50 in 29 minutes – the fourth 50-point game of his career – Lillard saw no reason to tempt fate. 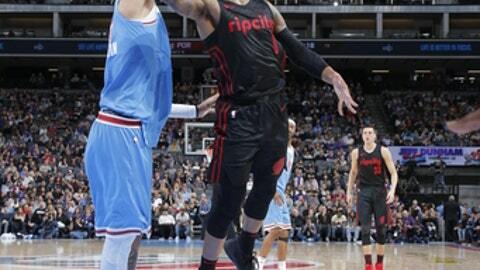 Lillard scored at will, making 16 of 26 shots – including eight 3-pointers – and all 10 of his free-throw attempts. His only action in the fourth came when Stotts sent him to the scorer’s table briefly after Sacramento cut Portland’s lead to 13. Blazers: Lillard’s eight 3-pointers were one shy of his own franchise record, which he matched earlier this season against Houston on Dec. 9. … Portland improved to 2-1 against the Kings this season. The teams split back-to-back games in November. Kings: Iman Shumpert, who was part of the trade that sent George Hill to Cleveland, arrived for the game but did not suit up. … Skal Labissiere (left rotator cuff strain) expects to return after the All-Star break. Joe Johnson, who was traded to Sacramento from Utah as part of the three-team deal, is unsure where his future rests. With expectations that the Kings will buy the veteran guard out of the remainder of his contract – which would make him a free agent available to sign with any team – Johnson has not reported to Sacramento. ”We did a super job on (Lillard) in the fourth quarter where we held him scoreless.” – Kings coach Dave Joerger.